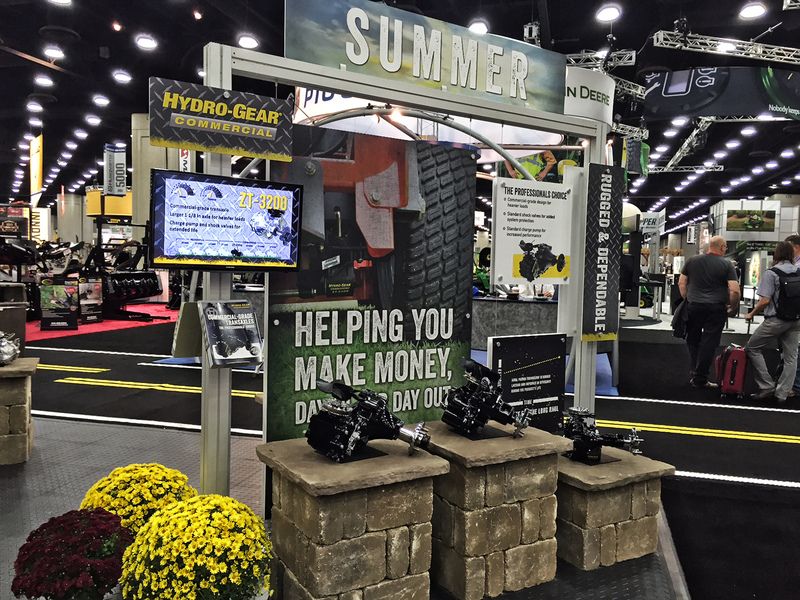 Hydro-Gear attended the GIE+EXPO show in Louisville, KY from October 21st through the 23rd. With a footprint the size of 27 football fields, this is the show for our industry. The attendance didn't disappoint again this year either with over 21,000 people walking through the doors of the Kentucky Exposition Center. With crowds that large, both our indoor and outdoor booths were buzzing all three days of the show. Taking advantage of having so many dealers, landscapers, users, and OEMs all in one place we showcased our newest, most compact Zero-Turn Transaxle. We also highlighted our Smartec by Hydro-Gear innovations with an electronic controlled system fit-up on a Gravely ProTurn that attendees were able to get hands-on experience with at our outdoor booth. And, we didn't stop there, Hydro-Gear showed just how rugged our transaxles can be with a paintball battle tank fit up with our ZT-3400s—they're Built Tank Tough—which kept a constant flow of interested attendees stopping by to take a spin. And, if you were inside checking out our indoor booth you didn't miss out on what was going on with our outdoor booth thanks to the live feed that we provided attendees that showed exactly what was going on. During the show, we had a chance to catch up with some of our valued customers. Watch to see what they had to say about working with Hydro-Gear. Hydro-Gear had a very successful show at GIE+EXPO 2015 and we're looking forward to 2016 where you will not want to miss what we have in store.